Preparing for Thanksgiving is overwhelming in itself. 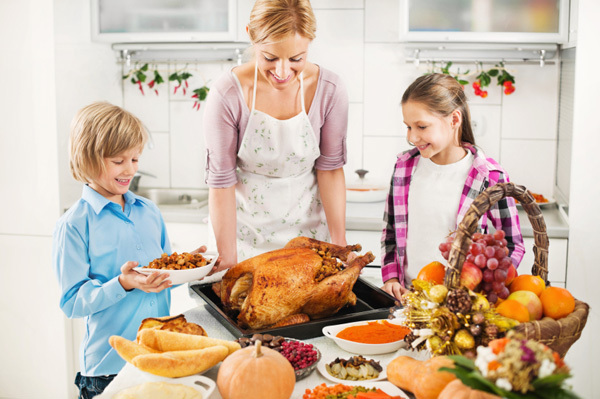 Preparing for Thanksgiving and how to make it more fun or enjoyable for children is also overwhelming. If you are looking for some ideas to help entertain or prepare your children About Parenting’s article, “Start a Thanksgiving Tradition With Your Child,” by Terri Mauro, Children With Special Needs Expert, has several ideas. The first idea suggested is to decorate together. Let them help pick out or place decorations. Or even better, have them create decorations- these could be placed on the dining table or around the house. Encourage them to create anything that they feel represents Thanksgiving. Looking for an easy idea? Try teaching your child how to create a hand turkey or have them write names on place cards for the table. The second suggestion is to have your child help you plan and prepare for the big meal. Let them make suggestions as to what should be served. Encourage them to help find items in the store. By getting them involved in selecting or preparing the food, you and your child can start new holiday traditions. It also never hurts to have some of their favorite foods so that they can enjoy the big day. Another suggestion is to relax with your child- when the time is appropriate for the both of you. It is easy to get wrapped in preparing food or the house (or both) for Thanksgiving, however it is important for both of you to find some relaxation. Relaxing together not only creates more memories but also helps you to be ready for the big meal or gathering later. Some ways to relax together include: watching a movie, going through photo albums, going for a walk, or playing games (inside or outside). If you have any ideas feel free to comment below! Follow Giving Foundation for Children for more stories like the above on Facebook.